Her cough has been lingering for a time. When we started moving in the car, Esmé nodded off, head forward–still sleepy from her nap. So it took me a bit to realize that she was now slumped forward, having brought up a bunch of mucus. I notice the glint of it as my eyes scanned the mirrors to merge onto the highway. I call to her first, but she doesn’t raise her head. There is no shoulder…and traffic now coming in via two lanes to my right. I swing my arm backwards, reaching for her leg, and call her name again, louder. Finally, she looks up at me, desperate, searching. Now coughing actively. Stuff leaking down her nose and into her mouth. I can see it move with her breath, as I watch her and the road. There is a shoulder now, two lanes over…where we would be stranded…or there is the exit just beyond. I think about the children all over the news, especially those reported on who remind me of Esmé—the boy with severe epilepsy separated from his grandmother and life-long caregiver. There’s the little girl with Down syndrome who was at the center of Corey Lewandowski “whomp, whomp” remark. I wonder about all the children, but these two haunt me in a deeply terrifying way…because I know that they need that much more in order to be safe and cared for—and it hits me at the center of the deepest fear I have as a parent: Who could care for Esmé as I do? No one. Not only because I am her mother, but because I am the strand that holds together her ability to be safe, understood. It is unthinkable that I would be separated from her. It is unthinkable. But it must be thought all the same. She’s not blue, I think. Yet. And I know enough to know that this may be nothing. A hiccup. Or it may be something–and I don’t want to be stuck on the side of the highway if I can help it. So I drive. This whole time, I realize, my lips have been moving…repeating, “It’s ok, Ez, Mom’s got you. It’s ok. We are almost there. I see you. I’m here. I’m going to help.” And so on. I do so while I scan the road and assess the color of her skin in the backseat. For a moment I think about this classroom that has suited my daughter so well–the room I wasn’t sure she could handle…where she would be, to my eyes, the most multiply-challenged child. I have grown so attached to this group of children, their patterns, their idiosyncrasies–the child who points and says “Mama” whenever I arrive to pick up Esmé. The girl who carefully adjusts my purse on my shoulder and wants to hold my hand. The boy who Esmé races in her wheelchair. The boy who cries so very often in a way that hurts my heart, and who my daughter adores. At the end of the year ceremony, Esmé is given the most “fabulous friend” award, because of her thoughtful and caring connections with these exceptional children. When she hears her name, she wheels proudly to the front of the room. Off the exit we pull into the first parking lot, a restaurant. As I turn in I look for people. It is what I always do: look for people, in case I need to yell for help. I see two men talking, presumably just finishing their meals. They are dressed in fatigues, and I think, as I pull hard into an open spot in front ok, I might need them…at least they probably won’t panic. But before I get leap out, they’ve each slid into their respective vehicles. I jump from the car and wonder if it is overkill to flag the closest one down as I do. I don’t do it. Plants are coming to life. They are asking to be seen, turned into something bigger than themselves. I’m torn between the desire to leave everything to run its full course while I watch—flowers blooming and falling—and the desire to pluck everything and turn it into some kind of magical cocktail. Making the cocktails, learning the scents and flavors of the new herbs, carefully considering what I will add to what, mixing them with care, and then holding the cool glass and clinking ice in my hand. I find the whole thing so calming. I like the drink too…but I like the process of making it more. I hear them discussing the last day of school. And I hear Esmé’s iPad pronounce the words, “sad, sad, sad, sad.” Her teacher acknowledges Esmé’s communication, recognizing that Esmé is sad that the school year is ending. Later I will speak with her, explaining that she will be back in the same classroom with the same teacher and almost all the same friends next year. And that she will be in the extended school year in a week and a half—with a new teacher, but her same friends and her nurse. When I reach Esmé in the backseat she still looks startled and scared. But then, as I wipe the three tablespoons of goo from her face and hair, she begins giggling. Like nothing happened. And I start to wonder if I have over-reacted. A few moments later, as I am about to pull out of the parking lot onto the road, she begins retching and coughing again. The line of cars behind me waits as I hop out of the car again and help her clean up. Mercifully (for them) no one honks. The New York State Democratic Primaries are this coming Tuesday. I’m looking at the swath of candidates, wondering which one has the best chance of defeating Congressman Faso—the man who Esmé and I met with over his healthcare vote last fall, whose staff seemed not to understand the basic functioning of Medicaid Waivers for children with disabilities. As I scan through the candidates healthcare policies, I see very thin evidence that they know much more, either. Much talk about universal coverage, no talk of individuals with life-long, life-threatening disabilities. So I write to them, as I wrote to the man who occupies the seat they want: hoping I am not shouting into an abyss, but fearing that I likely am. I watch her like a hawk the rest of the ride, but nothing happens. Finally we arrive at our destination. Once I’m parked I realize I am shaking. It has been awhile since I was afraid Esmé would stop breathing in the back of my car…but my body still remembers what to do. 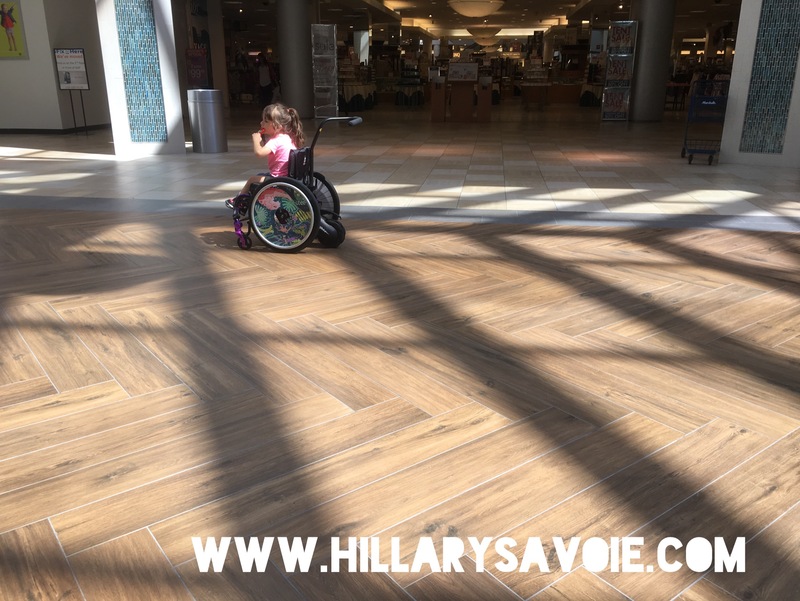 Standing in the mall, I watch Esmé’s excited motions as she gets to try out the SmartDrive, a battery-powered wheel that attaches to her chair and sort of turns it into a power chair, controlled by tapping a smartwatch that she or I wear. She was just struggling to breath in the backseat of my car, and now she is tapping her arm hard against her thigh, asking for more speed. While I still have a tightness in my chest and tears in my eyes. Please, Hillary, please keep telling us what you need the rest of us — those who don’t know — what we should be asking from our representatives. I don’t have the language right, but I do have the desire to get legislation that will help your child — and all other children who will need what Esme will need — get what they need. I’m up for the fight! Hi Debi! Thank you for your willingness to engage on these issues with your representatives. The questions that most concern me are the ones that often get missed by folks who are talking about protecting healthcare. So, generally, people who are aware are on top of asking about protecting people with pre-existing conditions, for example. The stuff that falls through the cracks are the costly items that help support families and individuals living with life-long, life-threatening severe disabilities…so things like coverage for diapers over age 3, elemental formula for tube-fed individuals (which was around 700$/month when Ezzy was getting only 900 calories a day), home modifications to help people pay for accessible bathrooms and hoyer lifts, good quality wheelchairs, copays on prescriptions and dr visits (imagine how those rack up if you have 20 specialists! ), and so on. Furthermore there needs to be investment in nursing and therapist populations so that people can get the care they need. These are typically the kinds of spots where there are hiccups in single-payer systems, so I get very nervous about those as well. My daughter is a Canadian citizen…but we aren’t there, and that has everything to do with healthcare. Voting has never been more important. Or maybe it has always been equally important but we were comfortable. Now everything is very uncomfortable and I will be studying to prepare for the right vote when it’s our turn. I love the in between story. After I saw the writing pattern I wanted to cheat to finish that story but I didn’t cheat. I love how you interlaced one story into several others. Hi Kenya! Thank you so much for the kind words! I love that you wanted to cheat the story (and that you didn’t!). And, I think you are right, it has always been important, we just were so very comfortable. I hope that all of this will lead to a more informed, better engaged citizenry. I hope. So good as always, friend. The fear of her not breathing – it breaks my heart that no matter how far she progresses that will always be with you. Here’s to voting and getting rid of the horror that is our nation right now. Your drink looks beautiful and I can understand the peace in the process of making it is soothing. Calming. That children recover so much more quickly than we do. Feels significant in ways I don’t yet understand. Because I know they remember too, but in such a different way. What a scary ordeal. And I’m so neurotic I’d probably be watching for it constantly. The special needs children being separated at the border are a new kind of evil. I didn’t even think of that and I’m sorry. The whole thing is a nightmare but that haunts me the most.